Arbor-Nomics® Turf Inc., an award-winning provider of Atlanta lawn, tree and shrub care, has launched a short guide that helps consumers make informed decisions when choosing a company to care for their property. 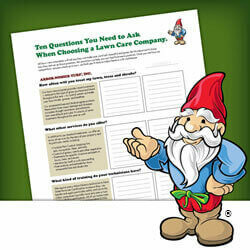 Available on the company’s website, the guide arms consumers with 10 questions they should ask any service provider when shopping around for lawn care. With the Arbor-Nomics guide, homeowners will learn what to look for in an Atlanta lawn care company and how to determine if they’re committed to delivering on their promises of a green lawn and healthy trees and shrubs. The 10 key questions cover service details, technician training, and evaluations and endorsements by consumer-protection organizations, such as the Better Business Bureau. The guide also includes Arbor-Nomics’s answers to each question, making it easy to compare service providers. When it comes to tech training, for example, users will learn that all Arbor-Nomics techs – known as Certified Landscape Specialists (CLSs) – are trained extensively before they ever treat a customer’s yard and receive ongoing education once they’re in the field. The company also requires every CLS to have State Pesticide Certification to ensure safe, effective pesticide application. Anyone shopping around for Atlanta lawn care can use this information to see how other companies stack up. Another thing that sets Arbor-Nomics apart? The guide itself. According to the company, Arbor-Nomics is the only lawn care company that offers homeowners such a fact-based tool for assessing a provider before signing on for service.